All frequencies are stamped on the tuning forks and the planets listed on the other side. Planetary book. 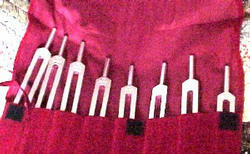 Cost: $24.99 plus $4.99 postage in U.S.
Set of 8 Chakra Colored Balls to put on the ends of your round tuning forks. Cost of set is $12.99 plus $6.99 postage in the United Staes.